Nowa formuła farby do tworzenia efektu osadu z glonów na burtach jednostek wodnych lub urządzeniach nabrzeżnych , hydrotechnicznych itp. Odcień jasny, łatwa w nakładaniu. 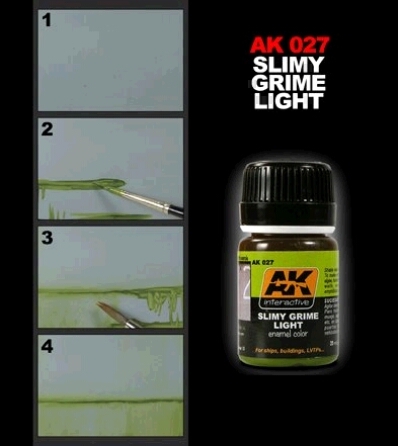 You can finally be able to make Slimy Grime effects with this new wash. Ships, boats, ports, wooden doors and many amphibious vehicles show this effect very particular due to the water and the humidity. Observe real pictures to use them like reference in your models. 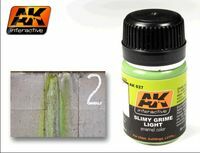 This product is enamel and it can be blended with the rest of our colors and it is diluted with our White Spirit.